Cielo Breez is a plug & play smart air conditioner controller. It's simple to install and easy to use. You can hang it on the wall or place it on a table in AC / Heat Pump's line of sight (free table stand included in the box). Check compatibility with your air conditioner remote by visiting Cielo WiGle website. Breez directly connects to your home Wi-Fi router and controls your air conditioner through IR signals. Download "Cielo Home" app and register your device. No additional hub or wiring is required. You can control your air conditioner from anywhere, anytime through your smartphone. In addition, Cielo Breez provides you a personalized way to show case your favorite moments. You can upload your favorite pictures. These pictures go directly from your phone to the LCD of your Breez. You can also control your ACs through simple voice commands using Alexa or Google Home. 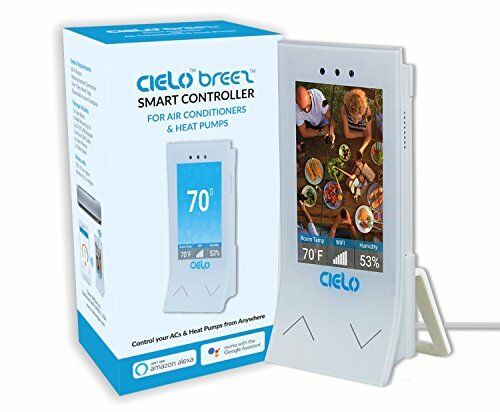 Cielo Breez Smart AC Controller is compatible with all major brands of Air Conditioners in the market. If your air conditioner comes with a remote that has a display, Breez can support it. If you face any problems with compatibility of the device with your Air Conditioner, our dedicated support team is always there to help. Cielo Breez helps you breath in clean air by keeping an eye on the air filter of your AC. Just check the status of air filter through your app or by asking Alexa as "Alexa, ask Cielo Home what is the status of Bedroom Air Filter". Breez gives you the luxury of single touch control for all your Ductless appliances by adding them in a single zone in your app. Cielo Breez provides complete usage audit of your connected ACs / Heat Pumps through "Cielo Home" Apps. These details keep you aware of your usage patterns and help you achieve your saving goals. Download our free apps by searching for "Cielo Home". These simple, intuitive and user friendly apps provide you ultimate control for your air conditioners and optimized user experience.